Jesty S.A., Kraus M.S., Johnson A.L., Gelzer A.R., Bartol J. 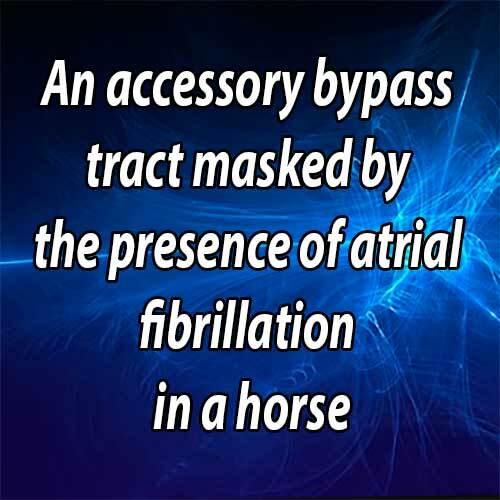 An accessory bypass tract masked by the presence of atrial fibrillation in a horse // J Vet Cardiol. 2011 Mar;13(1):79-83. Accessory bypass tracts are rarely documented in horses. Here, we present a case of an accessory bypass tract which was initially masked by the presence of atrial fibrillation. Evidence of ventricular pre-excitation was recognized after cardioversion to normal sinus rhythm and the horse was diagnosed with Wolff-Parkinson-White Syndrome. In people, atrial fibrillation in the presence of an accessory bypass tract is considered dangerous due to the risk of sudden cardiac death. Although we did not consider this horse safe to ride, he continues to compete successfully and has not had recurrence of clinically significant tachyarrhythmias. A 5-year-old 600-kg Warm Blood stallion used for dressage was presented to the Cornell University Hospital for Animals for further evaluation of a persistent tachyarrhythmia. He had recently competed successfully as a dressage horse but had a period of unexplained fevers 3 months prior to presentation. Twenty-one days prior to presentation, the horse was found sweating and agitated; physical examination by the primary veterinarian revealed a rapid tachycardia (heart rate ~ 180 bpm), which resulted in referral to a secondary care hospital. An ECG confirmed tachycardia, which was nonresponsive to lidocaine therapy (2 doses of 1 mg/kg IV slowly, 15 min apart). The following day, the rate had slowed slightly and a diagnosis of atrial fibrillation was made. Rate control was attempted at the secondary care hospital with various antiarrhythmic medications aimed at decreasing ventricular response. Digoxin (initial dose of 0.011 mg/kg PO q 12 h, increasing over 2 weeks to 0.013 mg/kg PO q 12 h) resulted in a decrease in heart rate (HR) to 120 bpm. Serum digoxin concentrations were consistently slightly low (0.37 ng/mL trough and 0.74 ng/mL peak). Nine days after digoxin was started, diltiazem was initiated in conjunction with digoxin (1.0 mg/kg PO q 8 h), but this did not further decrease HR and it was discontinued 5 days later. Treatment with atenolol (0.125 mg/kg PO q 12 h) was then initiated in conjunction with digoxin and increased the following day (0.23 mg/kg PO q 12 h), also without effect. Two cardiac troponin I samples showed barely detectable concentrations (<0.06 ng/mL). Two 24-h continuous ECG Holters revealed persistent atrial fibrillation with a rapid ventricular response and a ventricular conduction disturbance evidenced by wide and bizarre QRS morphology. Despite attempts at rate control, the horse remained significantly tachycardic, which prompted referral to the Cornell University Hospital for Animals. On presentation, the horse had a heart rate of 140 bpm with pulse deficits, an irregularly irregular rhythm, and no heart murmurs. Additional physical examination findings included normal facial pulses, mucous membrane color, capillary refill time and thoracic auscultation. Basic hematology and serum biochemistry were unremarkable. The initial ECG showed a tachycardia characterized by a nonpatterned R—R interval (irregularly irregular) with intervals ranging between 260 and 580 ms, no discernible P waves, abnormal QRS morphology with upper normal duration, and ST segment depression (Fig. 1A).1 A diagnosis of atrial fibrillation with a rapid ventricular response rate and an intraventricular conduction disturbance was made. An echocardiogram showed mild to moderate left atrial dilation (15.0-cm diameter on a left parasternal long axis view), very mild left ventricular dilation, normal valve morphology, and marked ventricular dyssynchrony with decreased systolic function (Fig. 1B).2 The vertical lines drawn in Fig. 1B highlight the dyssynchrony between systolic excursions of the septum versus the left ventricular free wall. Color Doppler echocardiography revealed mild mitral and trace aortic regurgitation. Because the rhythm was not adequately responsive to rate control with antiarrhythmic drugs, we elected to cardiovert the horse using transvenous electrical cardioversion (TVEC). The horse was successfully cardioverted using transvenous electrical cardioversion (TVEC) (150 J), which resulted immediately in a reduction in heart rate to 43 bpm. A post-cardioversion ECG showed a regular R—R interval, discernible P waves, and a normal heart rate; this represented normal sinus rhythm (Fig. 2A). The QRS morphology remained the same as prior to cardioversion and ST segment depression had improved but not resolved. The P wave was bifid, the PR interval was abnormally short (140 ms), and there was no isoelectric PR segment. The combination of a short PR interval, an abnormal QRS morphology and secondary changes of repolarization reflected in ST segment depression indicated that the horse had ventricular pre-excitation from an accessory bypass tract and is evidence of Wolff— Parkinson—White Syndrome (WPWS) during tachycardia.3—5 A post-cardioversion 24-h Holter recording revealed consistent ventricular preexcitation over a wide range of sinus rates. Repeat echocardiograms post-cardioversion revealed persistent dyssynchrony and mild dilated cardiomyopathy. The left ventricular end-diastolic diameter was larger (12.7 cm precardioversion, 15.0 cm post-cardioversion) likely due to longer diastolic filling times. The fractional shortening was low (18% precardioversion, 23% post-cardioversion) and the left ventricular end systolic diameter was increased (10.3 cm precardioversion, 11.6 cm postcardioversion) before and after transvenous electrical cardioversion (TVEC), but the severity of systolic dysfunction would be overestimated using these parameters because of ventricular dyssynchrony. 1A: Six lead ECG obtained on the horse at the time of presentation. Note the nonpatterned rhythm, lack of P waves, upper normal QRS duration with abnormal QRS morphology, and ST segment depression (except in lead aVR where ST segment elevation is seen). Paper speed = 50 mm/s, amplitude = 5 mm/mV 1B: M-mode echocardiogram of the right parasternal short axis view through the left ventricle. Note the irregular rhythm, decreased systolic function, and marked dyssynchrony. Scan frequency = 2.0 MHz, scan depth = 30 cm. 2A: Six lead ECG from the same horse after TVEC. Note the presence of P waves, the very short PR interval, and the abnormal QRS complexes. The ECG diagnosis is ventricular pre-excitation. Paper speed = 50 mm/s, amplitude = 5 mm/mV. 2B: M-mode echocardiogram of the rightparasternal short axis view through the left ventricle. Note the regular rhythm, increased left ventricular size, an improvement in systolic function with persistence of dyssynchrony. Scan frequency = 1.5/3.1 MHz, scan depth = 30 cm. The dyssynchrony appeared to be due to ventricular pre-excitation, as evidenced by the alignment of the upstroke of the R wave with the early septal systolic motion with an inappropriately short electromechanical delay (dashed line in Fig. 2B). At presentation, a diagnosis of atrial fibrillation was considered the most likely despite the lack of obvious fibrillation waves. Additionally, the QRS complex was positive in the base—apex lead and at the upper limit of the normal reference range for QRS duration at 110 ms, indicating abnormal ventricular depolarization. The differential diag- nosiswas irregular ventricular tachycardia (VT), but this interpretation was considered less likely for 2 reasons: First, at no time could we discern P waves on the ECG despite amply long diastolic intervals. We would expect to see dissociated P waves with VT unless the horse had concurrent atrial standstill (which would be very unlikely); second, the rhythm was very irregular, while typically monomorphic ventricular tachycardia tends to be regular in horses. We conjectured at the time of presentation that the horse may have experienced cardiac injury two months earlier when he had fevers (from a virus, for example) which resulted in multiple abnormalities, including atrial fibrillation, tachycardia, cardiac dilation, ventricular dyssynchrony and decreased contractility, and a ventricular conduction abnormality. Ongoing cardiomyocyte necrosis was ruled out in light of the normal cardiac troponin I concentrations. Another possibility was that the rapid ventricular response rate was in part the cause of the changes in cardiac structure and function (tachycardiomyopathy). Because the rhythm had not been adequately responsive to rate control and the horse had been quite tachycardic in the face of atrial fibrillation for a number of weeks, we elected to cardiovert the horse rather than further attempting rate control. We did not believe there was a contraindication to cardioversion. We elected to use transvenous electrical cardioversion (TVEC); we considered this a safer option than pharmacologic cardioversion with quinidine because quinidine’s parasympatholytic effects at the AV node can lead to increased ventricular response rate, which we believed was contraindicated in this case. After successful transvenous electrical cardioversion (TVEC), the ECG clearly showed all the hallmarks for ventricular pre-excitation across an accessory bypass tract (short PR interval, abnormal QRS morphology, secondary changes of repolarization reflected in STsegment depression). The lack of a discrete delta wave is probably due to it not being obvious in the frontal electrical plane (perhaps precordial leads would have shown a more obvious delta wave). Other possibilities include: First. the pre-excitation was responsible for only a small portion of total ventricular depolarization; in this scenario the fusion of the depolarization from the bypass tract and the depolarization from the AV node—His-Purkinje system might be less obvious3; second, the P wave might be the single positive peak and the second deflection might represent a delta wave. We considered this less likely because the single peaked P wave would be of abnormally short duration for a horse and because we would expect to have also seen the second deflection in the precardioversion ECG if it represented a delta wave. This ECG could also theoretically represent a junctional rhythm with retrograde atrial depolarization occurring just before ventricular depolarization. We considered this unlikely because the P wave morphology and the heart rate are completely normal (ectopic rhythms are usually either slower or faster than the normal sinus rate) and because we would have expected the P wave to have a negative polarity in lead II. Ventricular pre-excitation due to accessory bypass tracts (abnormal congenital extranodal conducting tissue between atria and ventricles) have been reported rarely in horses.6-8 Impulses may be conducted from atria to ventricles across the bypass tract, the AV node, or both. We believe in this horse, rapid transmission of atrial impulses across a bypass tract with a shorter refractory period and/or faster conduction velocity than the AV node resulted in the rapid ventricular response rate observed while the horse was in atrial fibrillation. The heart rate completely normalized once sinus rhythm was restored and the QRS complexes were similar during atrial fibrillation and during sinus rhythm, suggesting a similar mode of ventricular depolarization (i.e. at least in part anterograde across the bypass tract during both rhythms). In retrospect, there was evidence of the accessory bypass tract prior to transvenous electrical cardioversion (TVEC), and this case serves as a reminder that ventricular pre-excitation across an accessory bypass tract should be suspected in all cases of atrial fibrillation with an abnormal QRS morphology and an inappropriately fast ventricular response rate, even in species in which accessory bypass tracts are rare. Had we recognized an accessory bypass tract prior to cardioversion, our choice of antiarrhythmic drugs would have differed. Electrophysiologic mapping would be ideal for this horse, but thus far has not been performed in this species because of the need for biplane fluoroscopy to place the mapping electrodes. Thoracic fluoroscopy is currently not feasible in adult horses due to their size. Mapping is also a prerequisite for radiofrequency ablation of an accessory bypass tract, which is the treatment of choice in people and dogs with dangerous bypass tracts.3,4,9,11 Ablating the bypass tract(s) would be the only way to restore the safety of riding this horse. Despite the recommendation to refrain from riding this horse, he continues to train and compete successfully three years after transvenous electrical cardioversion (TVEC) and has not had recurrence of atrial fibrillation. In conclusion, we have presented here an interesting case of WPWS in a horse, which was initially masked by the presence of atrial fibrillation. This combination of arrhythmias has not been previously reported in this species. The presence of pre-excitation across an accessory bypass tract in a horse with documented tachyarrhythmias has important ramifications on the assessment of safety for this horse to be used as an athlete. Durando MM, Young LE. Cardiovascular examination and diagnostic techniques. In: Robinson NE, editor. Current therapy in equine medicine. 5th ed. Philadelphia, PA: Saunders Elsevier; 2003. p. 572-585. Pipers F, Hamlin R, Reef V. Echocardiographic detection of cardiovascular lesions in the horse. J Eq Med Surg 1979;3: 68-77. Olgin JE, Zipes DP. Specific arrhythmias: diagnosis and treatment. In: Libby P, Bonow RO, Mann DL, Zipes DP, editors. Braunwald's heart disease: a textbook of cardiovascular medicine. 8th ed. Philadelphia, PA: W.B. Saunders Company; 2008. p. 863-922. Obel OA, Camm AJ. Accessory pathway reciprocating tachycardia. Eur Heart J 1998;19(Suppl. E):E13-E24. Tilley LP. Ventricular pre-excitation and the Wolf- f-Parkinson-White syndrome. In: Essentials of canine and feline electrocardiography. 3rd ed. Philadelphia, PA: Lea and Febiger Company; 1992. p. 179-181. Delahanty DD, Glaxier DB. The Wolff-Parkinson-White (atrioventricular conduction) Syndrome in a horse. Ir Vet J 1959;13:205-207. White II NA. ECG of the month. J Am Vet Med Assoc 1977; 171:1236-1238.
Cooper SA. Ventricular pre-excitation (Wolff-Parkinson-White Syndrome) in a horse. Vet Rec 1962;74:527-530. Yee R, Klein GJ, Guiraudon GM. The Wolff-Parkinson-White Syndrome. In: Zipes DP, Jalife J, editors. Cardiac electrophysiology: from cell to bedside. 2nd ed. Philadelphia, PA: W.B. Saunders Company; 1995. p. 1199-1213. Sarubbi B. The Wolff-Parkinson-White electrocardiogram pattern in athletes: how and when to evaluate the risk for dangerous arrhythmias; the opinion of the pediatric cardiologist. J Cardiovasc Med 2006;7(4):271-278. Wright KN, Knilans TK, Irvin HM. When, why, and how to perform cardiac radiofrequency catheter ablation. J Vet Cardiol 2006;8:95-107. An update on canine cardiomyopathies - is it all in the genes?